Home » News » Presenting a Professional Image – It’s time to revisit an important topic. Presenting a Professional Image – It’s time to revisit an important topic. As pet care ambassadors, it’s our job to keep things looking professional. In my opinion, there are plenty of salons and pet businesses that fall far below the realm of professionalism. I know the saying can be cheesy – but seriously – dress for success. Would you want to get have your personal pet groomed by someone who doesn’t take pride in his or her own personal presentation? Would you feel confident that his grooming shop was clean, sanitary, and safe? I know it can get tiring to dress up a little every day. However, our clients are entrusting us with the care of their pets. Like it or hate it, you can easily influence their trust factor simply by the way you look when you greet your clients. Think of yourself as your own brand. Don’t you want your product to be consistent and look great? Of course! And your clients are looking for that, too. 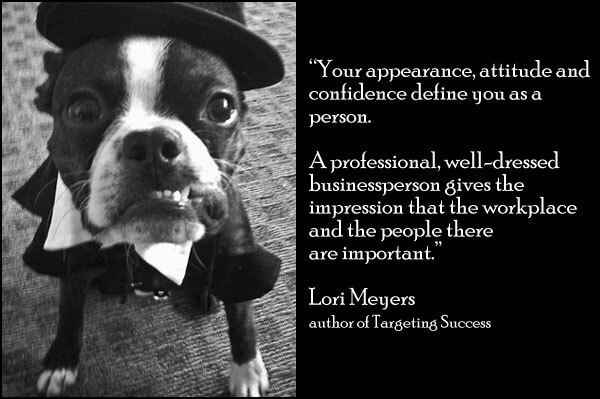 A fashionable, well-groomed appearance is essential when it comes to professionalism in this industry. When you are in a salon, kennel, pet resort, veterinarian clinic, or mobile grooming unit, you have to look the part. Come to work each day looking crisp, clean, and pulled together. Blue jeans, sweat pants, and athletic shorts ARE NOT professional attire! Black, white, or khaki slacks work well. Longer skirts are great for women and so are skorts in warmer climates. Conservative shorts or Capri’s may work for your environment, as well. I’ve even seen leggings work when paired with an over-sized, long top or smock. Look for clothing that is not prone to wrinkling or be prepared to learn how to iron! Remember, low-cut tops and short-shorts are never professional! If you have shorts that are too short or a top that is too revealing (especially when you are squatting down to pick up a dog), then you’re not displaying professionalism. Muscle shirts and shirts with the sleeves cut off don’t make the grade, either. Don’t forget your footwear. Most pet groomers are on their feet for hours. You are standing, lifting, bending, squatting, and twisting – all day long. Although clients may not be looking at your feet, having solid, supportive footwear will promote comfort for to you. Being comfortable makes it easy for you to be warm and friendly to all your clients. Supportive footwear will also enhance the longevity of your career. Over the long haul, your feet will take a beating. Don’t skimp on your footwear. Invest in the best. Scent is a very powerful sense. 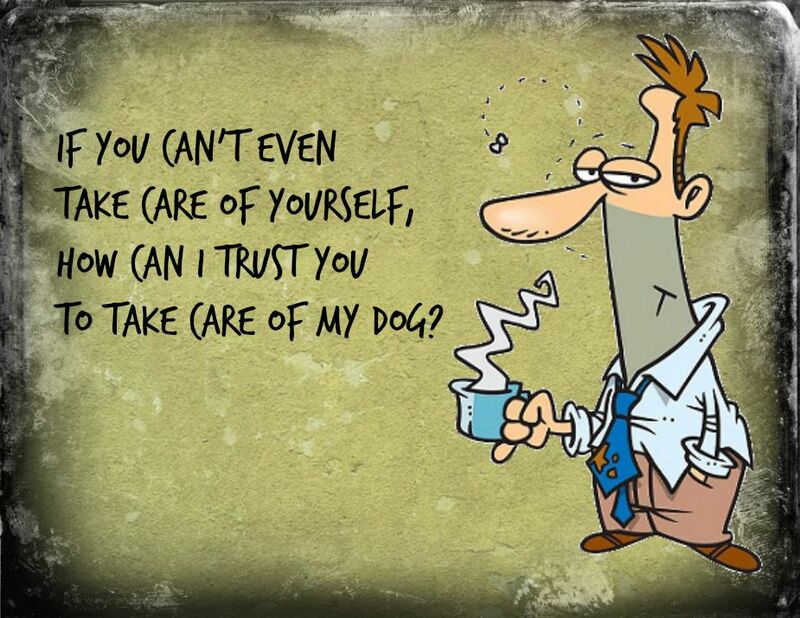 When it comes to your perfume, cologne, or fragrance you put on pets, be light-handed with the spray. Many people have allergies and are sensitive to fragrance. Plus, if you have multiple staff members wearing all different scents, it can be unpleasant for all. The same can be said for your makeup and hair color. You want to appeal to a wide range of clients, so conservative is best in most cases. When in doubt, be a minimalist. Remember, you can always “be yourself” once you leave the shop. While we are on scent – what about your breath? If you are communicating to others – clients or coworkers – bad breath is down-right offensive. Brush, floss, and use a mouthwash regularly. Not only will it save your teeth, your clients won’t be offended as you discuss what trim will work best on Fluffy today. Breath mints and gum can be helpful between brushings. Lose the gum quickly once it has done its job. Chewing gum in front of clients is distracting and it is unprofessional in front of clients. It’s no fun to listen to someone chomping away while on the phone, either. The same can be said for eating and drinking on the floor. Keep snack and coffee breaks limited to behind closed doors. Proper hygiene is crucial. It should go unsaid, but being clean and odor-free is a must. There is nothing more offensive – and embarrassing – than personal body odor. The famous motivational speaker Zig Ziglar, said, “People often say that motivation doesn’t last. Well, neither does bathing – that’s why we recommend it daily.” Nothing could be more true! Having well-groomed fingernails is what I consider a bonus. Working with dirty dogs and trimming toenails lends itself to dirty fingernails – even if you do a lot of bathing. Trimming Poodle feet has a tendency chip fingernails. Personally, I liked to keep my nails painted. Painted fingernails will hide all sorts of flaws. Unfortunately, when you do a lot of bathing, standard nail polish has a tendency to peel off quickly – sometimes in as little as one day. My solution was to have my fingernails professionally done every two weeks. Both acrylic and shellac nail applications seem hold up well to the abuse groomers put their hands through. Ragged nails on women and men can be easily tidied up. When you give the pet to the owner, their eyes are naturally drawn to your fingers as you hand over the leash. Wouldn’t filed nails make a great impression? Plus, it gives you a little time to pamper your most valuable asset – YOUR HANDS! …it’s a sign of a lack of respect for you and your profession. It may be time to be honest about your personal presentation. Your appearance should convey the message, “I’m a professional and I deserve respect.” When you respect yourself, others will, too. As pet care ambassadors, not only is it our job to groom pets – but it’s also our job to present a professional image for our industry. Can you afford to look like you just rolled out of bed and ran into work? What about trade shows? How does it look when you accept your award at a grooming competition when the pet looks better than you do? How can you command respect from your peers and clients when you don’t look the part? I don’t know any successful person who doesn’t sweat the details. Being impeccable, both personally and in your workspace, shows the client that you care about yourself. The message you are sending out is that you are confident with your skills. You are successful. You respect yourself enough to do the same for them – and for their pet. What do you think? Do you feel like a professional? Jump over to the Learn2GroomDogs Facebook page and tell us about it.